In 1832 the Fourth Sea Lord of the Admiralty suggested there was a need for ‘theoretical instruction’ in gunnery. Thus what had been previously considered an art became a science. Marine artillery embraced the science and technology of the age, and this modernisation of gunnery was aligned with a transition from sail to steam ships. As a consequence, sailor lives changed dramatically from that time. However, as naval life became highly technical, and warfare became a science, a human desire was expressed for a sailorly re-enchantment, or reconnection, with the previous symbiosis with the natural world. For the Royal Navy in Portsmouth, evidence of this can be witnessed be the creation of a zoo and farm which flourished on the newly-built School of Naval Gunnery on Whale Island up until the Second World War. 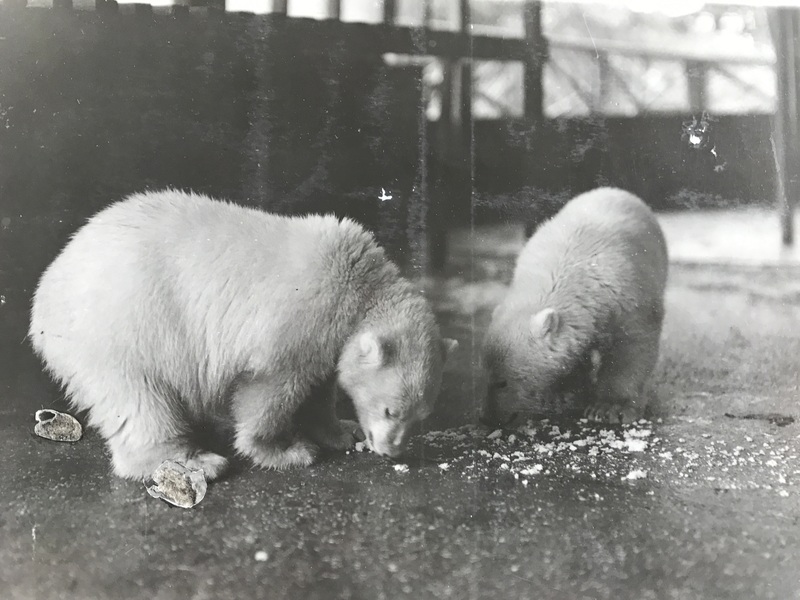 By the mid 1930s Whale Island was home to a private ‘Sailor Zoo’ that provided a hint of the magical, and a local mythology was built on stories of exotic animals and beautiful gardens that existed within the confines of the gunnery school. The zoo provided a sailor pastime that was enjoyed by all ranks. In addition, it became famed in the wider civilian community when public open days proved it to be extremely popular. It has been well documented that sailors had a strong affection, curiosity and abiding respect for the natural world, especially for the animals and birds they met on their travels and maritime superstition engendered a feeling of obligation and reverence towards the non-human world. Sailors had animals on ships both as a food source and as companion animals. In addition it was common for animals to be given as gifts to ships companies and for sailors to buy ‘exotic’ animals on their travels. The bears were matched in their star quality by the lions. Records show that the zoo hosted Peter and Rex two adult males and Lola and Lorna two females, between them two litters of cubs were born. Lola was presented to Whale Island by Dr M. A. Molloy of the Department of Veterinary Science and Animal Husbandry, Dar es Salaam, Tanganyika Territory. It was recorded that she arrived in Portsmouth on 12 November 1934, having taken passage in the SS Dunbar Castle. 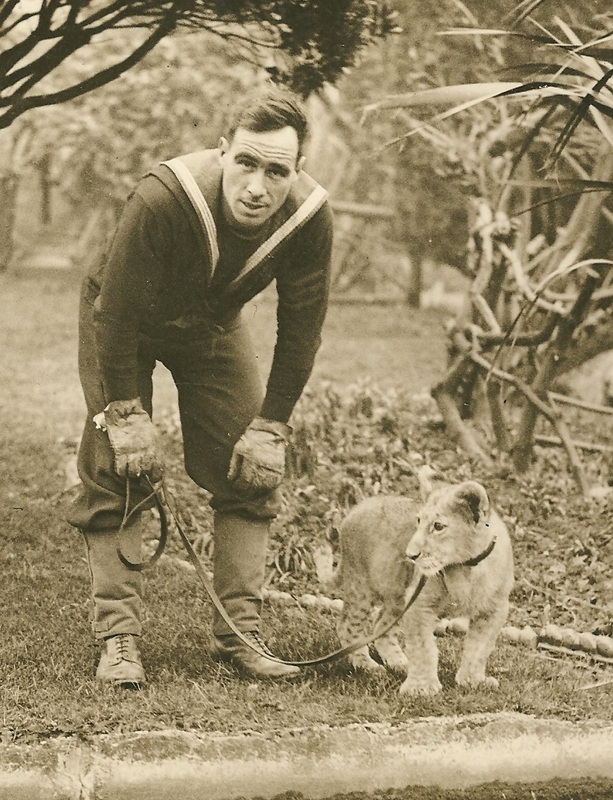 Although it is recorded that a lion was ‘strolling peacefully along the path on top of the parade ground’ having escaped whilst her quarters were being cleaned, by far the most bizarre story in the history of the Sailor Zoo is that of the ‘Boy who had no fear’. 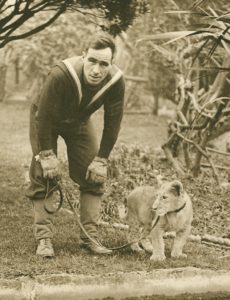 This event became national news and records the occasion when a visiting ten year old naval cadet attempted to distract or taunt the lions. The Evening News of 3 May 1939 states that the cadet fell into the lion’s den but other reports suggest that he just got too close to the inner cage railings. All reports say that the presence of mind of nearby sailors saved the boy when they beat the lion (Topsy) off with sticks. The island’s doctor, Surgeon Commander H. E. Scargill, treated the boy before he was taken in a Police Ambulance to the Royal Portsmouth Hospital. Not all animal residents were so intimidating and many of the exhibits were fairly domesticated such as the wallabies and deer that are recorded. In addition there was a considerable aviary with thirty four species of bird logged in the 1936 record book. The enclosed birds were accompanied by water fowl that lived on and around the ornamental pond designed and created by officers and men on the island. The pond was close to a famed rose garden, the remains of which still exists. Anon (1919) , A Short History of Whale Island: Compiled from Information Supplied by Past and Present Officers and Men (2nd Edition). Sir J. Pechell wrote in detail to Admiral Sir Thomas Foley, Commander in Chief at Portsmouth, about his desire for a proposed School of Gunnery Instruction. Robert Travers Young. The House that Jack Built: The Story of HMS Excellent. (Aldershot: Gale and Polden Ltd, 1955). ‘Keepers in Chief of the Navy’s Pets,’ The Evening News, 30/01/1932. Richard Jenkins. “Disenchantment, Enchantment and Re-Enchantment: Max Weber at the Millennium.” Max Weber Studies 1, No. 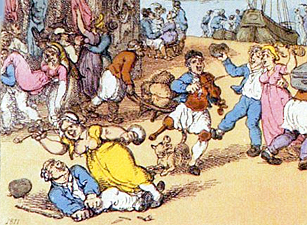 1 (2000); pp. 11-32. ‘The Bear that “cleared the Decks on a Battle Ship”’ The Evening News 03/08/1937. Robert J. Hoage and William A. Deiss. New Worlds, New Animals: From Menagerie to Zoological Park in the nineteenth century. (Baltimore & London: The John Hopkins University Press, 1996), 19. Jenkins (2000) Disenchantment, Enchantment and Re-Enchantment. ‘The Bear,’ The Evening News. Amelia died in 1903. Esquimalt became the headquarters of the Royal Navy’s Pacific fleet in 1865 (until 1905) and HMS Grafton had been flagship of the Pacific Fleet from 1901. ‘Keepers in Chief,’ The Evening News. Travers Young. The House that Jack Built: The Story of HMS Excellent, 53. For example, the story appeared in the press om 04/05/1939: ‘The boy who had no fear,’ Daily Mirror, ‘Mauled by Lioness’ The Evening News, ‘Boy Clawed at Zoo’ Daily Herald. 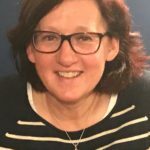 Dr Sue Diamond lectures in Sociology at the University of Portsmouth. Her PhD, "From Rating to Officer: Habitus Clivé and other struggles associated with promotion in the Royal Navy" investigated the move from rating to officer in the Royal Navy from 1934 to 2012. The core area investigates social class and material culture in the Navy and in addition discusses educational provision and sport and cultural practices in the 20th century navy. She is currently working on a paper about the cult of the Special Forces (specifically SBS, SAS and Royal Marine specialist units).